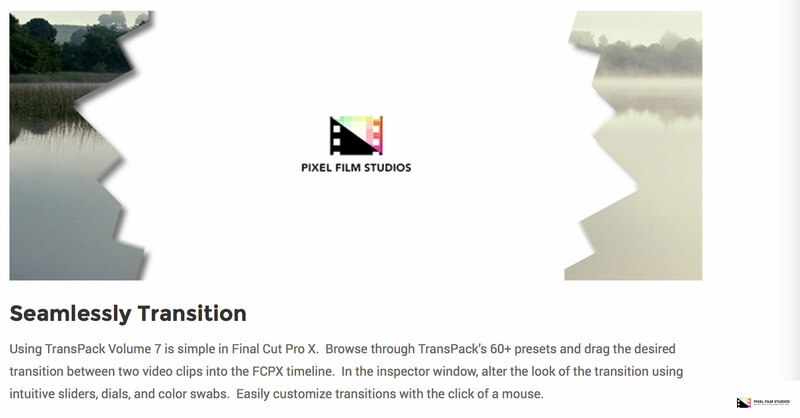 "This plugin comes with 60 customizable transitions that are easy to use inside of FCPX," said Christina Austin - CEO of Pixel Film Studios. 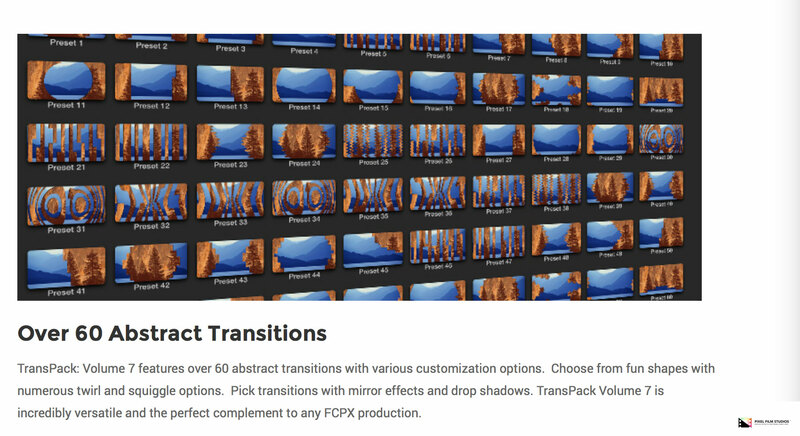 TransPack Volume 7 features over 60 customizable transitions created exclusively for use within Final Cut Pro X. Choose from abstract transitions to more simple wipes with blur & drop shadow options. Utilize the controls in the inspector window to alter transition direction, drop shadows, and more. Seamlessly transition from one clip to the next with TransPack’s easily customizable styles. TransPack: Volume 7 features over 60 abstract transitions with various customization options. Choose from fun shapes with numerous twirl and squiggle options. Pick transitions with mirror effects and drop shadows. TransPack Volume 7 is incredibly versatile and the perfect complement to any FCPX production. Using TransPack Volume 7 is simple in Final Cut Pro X. Browse through TransPack’s 60+ presets and drag the desired transition between two video clips into the FCPX timeline. In the inspector window, alter the look of the transition using intuitive sliders, dials, and color swabs. Easily customize transitions with the click of a mouse. TransPack Volume 7’s incredible versatility makes it applicable to just about any video style. Use abstract styles for fun videos and cleaner styles for more professional media. Utilize drop shadow controls for different feels. 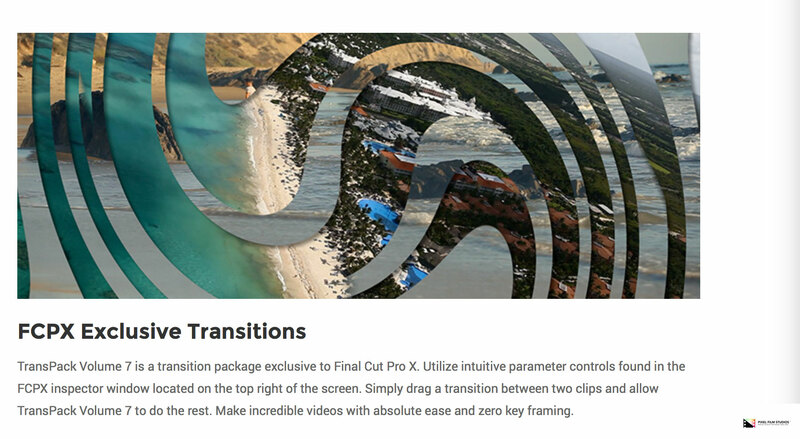 Add a unique transition to any FCPX production. TransPack Volume 7 is a transition package exclusive to Final Cut Pro X. Utilize intuitive parameter controls found in the FCPX inspector window located on the top right of the screen. Simply drag a transition between two clips and allow TransPack Volume 7 to do the rest. Make incredible videos with absolute ease and zero key framing.